I mentioned J.D. Biersdorfer's iPod: The Missing Manual in Resetting the iPod's Display Language When You Don't Know the Language It's Using. This reference and resource for iPod users is currently in its sixth edition, covering the iPod classic, the third generation iPod nano with video, the latest iPod shuffle, and the iPod touch. The iPhone, which has its own Missing Manual, isn't included. 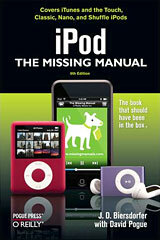 iPod: The Missing Manual got a major makeover with its 5th edition in 2006, transitioning from the classic Missing Manual motif to a new black and green cover theme. In contrast with the previous editions' copious white spaces, it now has color illustrations instead of the erstwhile grayscale ones. Page, chapter, and topic information appear in Aqua-style title bars, albeit positioned at the page bottom. It also has a slimmer book format and a reduction in price from $24.99 to $19.99. In terms of appearance, the 6th edition is very much an evolutionary development from the 5th, but the comprehensive update of Apple's four iPod lines across the board, plus one entirely new model (the iPod touch), necessitated a substantial rewrite of the book's editorial content. As author J.D. Biersdorfer observes, "By the end of my book, readers will understand how the iPod works, not only for playing music and video, but all the other things it can do, like storing phone numbers or keeping your mind working with a few rounds of iQuiz." Perhaps a testimony to the substantial collaborative effort required to bring what has become the standard and authoritative reference for keeping iPod users up to date, Missing Manuals series founder David Pogue is back sharing co-authorship credit. The iPod touch especially (an interesting stylistic note: for some reason the authors have chosen not to use the Apple convention of all lower case for the iPod models' names; they capitalize Nano, Classic, Shuffle, and Classic throughout this volume) with its touchscreen interface required a lot of completely new tutorial material. "That touchscreen interface used on the touch," says Biersdorfer, "has the potential change how we interact with computers of all types. When you see how easy it is to manipulate photos or tap your way across the Web on the touch, you can't help but think about when this technology is going to start dominating the rest of the computers we work on." 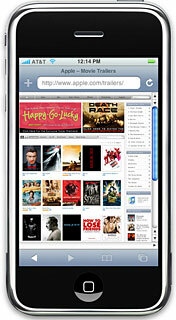 And author says one of her favorite things to do with the iPod touch is use the Safari Web browser to visit http://www.apple.com/trailers. "Most of the time you just need to tap the arrow on the video window to start streaming that movie across the touch screen," she notes. "I also like to stream Internet news broadcasts off the BBC's Website," she adds, "tap a download link for a show, and you get an earful about what's going on in the rest of the world." iPod: The Missing Manual 5th edition took a serious trip to the fat farm, trimming down from the fourth edition's portly 315 pages to a svelte 240, but this edition is up to 278. It includes a completely new chapter, "Touring the Touch", and the big iTunes chapter in edition five is now broken down into separate chapters for iTunes "Basics" and "Power Moves". There is some other chapter rejigging, and another all-new chapter covers the iPod as personal assistant, for a total of 13 chapters. Even with the extra pages, something had to get the heave-ho, that being any specific instructions for, or even passing reference to, earlier generations of the iPod. Models covered include only the four iPod model families introduced in 2007. This is arguably a sensible and necessary rationalization, and if you have an older iPod, much of the information in the 6th edition will still be relevant and useful, but it may be better for you to look around for a remaindered or used earlier edition of iPod: The Missing Manual. The instructions that are provided for the current iPod models are considerably leaner and less prolix than in 4th and earlier editions, but the new edition is, if anything, even more profusely illustrated with full-color photos, screenshots, and graphs than the 5th Edition was. Chapter 1 is called "Meet The iPod: Out of the Box and Into Your Ears in 15 Minutes", which thematically sets the pace and motif for what is to follow. Covered in this chapter are concise descriptions of the current iPod model families, plus short tutorials on unpacking a new iPod, installing iTunes, locating music, connecting the iPod to computers, charging the unit, and using the various controls. Chapter 2, "Bopping Around the iPod", tells you what you need to know about getting the most out of playing music on the iPod, how to navigate and manipulate the menus, searching for songs, adjusting volume, exterior appearance maintenance, playing games on your iPod, and security tips. Chapter 3, "Touring the Touch", provides 15 pages of tutorial information on using the new iPod touch, including the home button and Home Screen, the other screen icons, the Music, Videos, Photos, and Settings menus, tips on fingerwork, customizing menus, Cover Flow, and more. Chapter 4, "iTunes Basics", addresses the stuff you would expect from the chapter title. Chapter 5, "iTunes Power Moves", takes you well beyond the basics with 24 subhead topics ranging from finding and rating songs through improving playback quality with the Graphic Equalizer, accessing Internet Radio, editing, adding artwork and lyrics, using iTunes to configure the iPod, making backups, and much more. Chapter 6, "The Power of Playlists", tells you what you need to know about creating and managing playlists on your iPod - and even burning them to a CD. Chapter 7 is "Shop the iTunes Store", with instructions and tips on buying songs, albums, movies, videos, books, and games at Apple's online iTunes Store, and what you can do with them once they're downloaded. There is even a section addressing issues dialup users will encounter with the iTunes Store. Chapter 8, "Videos Everywhere", gives you the lowdown on using videos and movies on your iPod, whether they're ones you download from online sources or that you create yourself with a digital video camera and Apple's iMovie. Chapter 9 is about "Picturing Your Photos on the iPod", using the iPod as a photo archive and slideshow device, either on its own display or outputting to a TV. Chapter 10 brings you up to speed on all the "The iPod as a Personal Assistant", such as serving as an electronic address book or calendar, a stopwatch or world clock, a portable hard drive, a text file reader, and an audio recorder. Chapter 11, "iPod Touch(ing) the Web", tells you how to connect via WiFi, walks you through using the mobile version of the Safari browser, tells you how to use the touch keyboard, covers working with Safari Bookmarks, audio and video on the Web, and a variety of other Internet - related topics. Chapter 12, "iPod Out Loud", tackles taking your iPod on the road, playing it through FM radio speakers and connecting it to an automobile stereo system, alternate power sources, connecting the iPod to your home entertainment system, streaming music over Airport Express or through portable speakers, and where to find cool iPod stuff. Chapter 13 is the troubleshooting chapter, entitled "What To Do When the iPod Isn't Working Right". It begins with the "5 (or 6) -Rs" of iPod repair - Reset, Retry, Restart, Reinstall, and Restore, plus a specifically iPod touch set of Rs: Recharge, Restart, Reset, Remove, Reset Settings, and Restore, with corresponding tutorials on each category. There is also a section on understanding the iPod's battery messages and some tips on prolonging battery life, as well as on AppleCare, finding professional repair help, and Apple troubleshooting resources. For more detailed chapter outlines, visit the iPod: The Missing Manual "Missing CD-ROM" page. iPod: The Missing Manual 6th edition really is a resource you should have if you own any current model iPod and want to get the most out of it. At the price of twenty dollars, it's a great deal. I have to concede that I lament the passing of the classic Missing Manual look, but the attractiveness of the full color presentation compensates a fair bit, and while I'm partial to the more prolix and detailed text content of the early editions, I'll concede that for the average iPod user, this more bare-bones approach makes sense, and the book will be more likely to be referenced frequently. Low End Mac Rating, 3 out of 4.